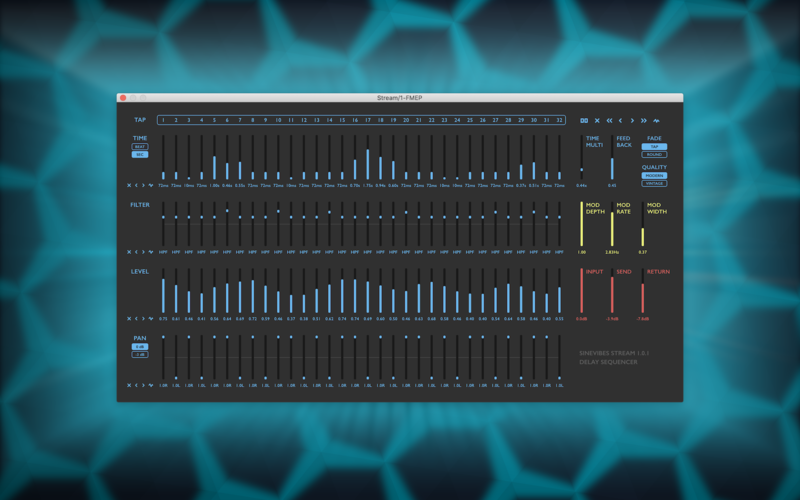 Stream is a delay sequencer Audio Unit plugin for Mac. It features an array of 32 individual delay taps routed sequentially one after another, with gradual or stepped feedback. Each tap is routed into its own filter and has dedicated level and pan parameters. The delay sequence includes variable stereo modulation which is uniquely applied with phase inversion between odd and even taps. Stream allows to choose between modern and vintage characters and has a time multiply control to slow down or speed up the whole delay sequence up to four times, as if it was a sampled loop. With such immense configurability, Stream can create a whole symphony of reflections – from organically chaotic to precisely rhythmic – and anything in between. It’s a delay that looks like a sequencer and a sequencer that works like a delay. Multiple utility functions for individual or global tap parameter shifting and looping.